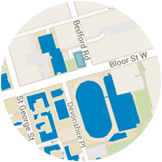 The policy of U of T requires encryption of all personal and confidential electronic information kept outside of secure U of T servers. The Practicum Office recommends that NO practicum related information is removed from the setting – in hard copy, memory key, lap top, or smart phones. Privacy protection of the practicum organization’s information and privacy of the people whom they serve is paramount. When in practicum, familiarize yourself with the policy of the practicum setting: How the setting handles electronic and hard copy data. Early recognition and feedback regarding barriers to learning are important. Students, Field instructors and FFLs should communicate their observations and concerns to each other as soon as they are identified. Students, as well as clients, are better served by early recognition of significant performance difficulties. It is important that any personal information be treated confidentially by the practicum participants (student, field instructor, relevant agency staff, FFL and Practicum Office). Please note: Only when students have terminated their practicum using the procedures outlined above can they begin to pursue other practicum opportunities. It is the responsibility of the student and field instructor to identify any problematic behavior pattern or major issue in the practicum. The student and field instructor are to document their attempts in the learning/teaching experience to address these difficulties. Where there is an educational coordinator, their role is to become involved when the student and field instructor cannot resolve the issue. It is the role of the educational coordinator and the FFL to assist in supporting the field instructor and student in dealing with problems in the practicum. Student or field instructor can initiate contact with the FFL when questions or problems arise in the practicum. Appropriate referral to campus and community resources can occur. Most concerns can be dealt with through identification and discussion of the issues. However, should the issues not be resolved through this process, a Review Meeting is arranged. The FFL will set a Review Meeting with the field instructor, student, and other appropriate persons such as the educational coordinator to review the situation, and document the process and outcome. a) the FFL will review a sample of the student’s practice selected by the field instructor and student. The FFL will assess the student’s practice and document this assessment. The student, field instructor, and Practicum Office representative will be given copies of this assessment. An Educational Review may also be recommended at this time. b) in direct service settings, it is the student’s responsibility to assure the availability of audio/videotapes, process recordings or another method of observation of direct practice for the field instructor and/or FFL review. In indirect settings students must provide written process records and/or reflection logs to the field instructor. ii) The participants will work toward a clear identification of problems in learning and teaching. v) The FFL will document the process and outcome of the Review Meeting. A copy will be given to the student, field instructor, and Assistant Dean, Field Education. vii) Should the student not meet the competency expectations a No Credit (NCR) will be assigned. The Faculty’s Assessment Committee has the authority to review the grade. No Credit (NCR) is the equivalent of a failure (FZ) grade in an academic course and is subject to the same regulations. viii) The FFL and Assistant Dean will establish conditions to be met before the student can renegotiate a practicum. Students who terminate the practicum will normally defer their next practicum until the next semester. The Practicum Office cannot guarantee when a replacement practicum will be located. The replacement practicum must comply with SGS registration time lines to commence in September, January or May and cannot begin outside of those time lines. This may result in additional registration fees. To complete the practicum course requirement and receive a credit for the practicum the student must demonstrate social work competencies as per the practicum evaluation tool and complete the negotiated number of practicum days. The FIFSW recognizes the right of the practice setting, ideally after consultation with the agency director/educational coordinator, and the Practicum Office, to terminate the practicum if the student’s behavior is unacceptable and/or client service/patient care is compromised. (See the University of Toronto Standards of Professional Practice Behaviour for all Health Professional Students).In such circumstances the Practicum Office must be advised in writing of the reasons for this decision and action. In exceptional circumstances, the Practicum Office may pre-empt some of these stages. In keeping with the University of Toronto policy on Human Rights and the Mission Statement of the FIFSW all students are expected to be treated equally. This applies to the interview and selection process as well as the practicum. Agency personnel and students are instructed to read and respect the Human Rights Codes and students who believe they may be subject to harassment or oppression are encouraged to discuss arising concerns with their FFL. As with other course, students have the option to drop the practicum courses SWK 4701 or SWK 4702. When a Course Add/Drop form is submitted to drop a practicum course, no course credit from the terminated practicum will be applied to future practicums. The student must complete the School of Graduate Studies Course Add/Drop form and submit to the FIFSW Registrar. The final date for submitting the form without academic penalty for students in “F” course (SWK 4701) is nine weeks after the practicum has begun, and for the “Y” course (SWK 4702), the end of February. See the School of Graduate Studies Manual of Grading Policies and Procedures for exact dates. A student may ask an agency employed field instructor to be a referee but such a reference will not be considered an official University reference. Under no circumstances may an academic letter/numerical grade be stated or copies of practicum evaluation be issued by the referee. Reference letters may be sent from the FIFSW only if there is consent by the student which can be provided by e-mail or in writing. If there is no written request, a reply should be sent to the inquirer saying that we have no consent from the student. Typically, references are provided for students who have been out of the program for the first three years. After this period, the reply merely provides the basic information as to the time the student was registered and that he/she did or did not complete the program. References for students still in the program/practicum should be brief, indicating that a full evaluation can be provided only after completion of the academic year. References for students who have finished one year and are not planning to return for the second year should be concerned only with the performance of the student and should make no statement that the student is ready for professional practice.